Naturally, he likes to be close to his airplanes — who doesn't? — which is why he's configured his home to provide easy access to the planes... and a nearby runway. Can you imagine? Wake up, grab some breakfast in the kitchen, and then stroll out the driveway and into your private 707... while still in your bathrobe and slippers! Frankly, we might have gone with a more stylish design for the covered jetports --something sort of Googie, perhaps? On the other hand, the main house includes a small control tower, and that's always in fashion. Anyhoo, an intrepid explorer recently took a drive through Travolta's aero-compound, and returned with some video footage. The quality isn't great, nor is the spelling, but that's not really the point, is it? Neat stuff. What you failed to mention is Travolta is the only private citizen in the United States who owns a former Boeing 707, according to a 2003 Forbes Magazine story. this is not a home to anyone who is balanced. that place is a mental institution. occupied or not. john you are a perfect example of a newly rich idiot..so terribly affected it's abolutely repulsive. you MUST refer to the action o eating to "DINING"!!!!!! I saw you blunder that mask on(ANOTHER PHONY) the oprah show. you caught yourself right in the middle of the word "eat-----=-" OH MY GOD AND quickly ahhhhhhh corrected it. to DINING!! we dine we dine WE DINE. how long can you keep up this facade--- i mean the whole deal???? the gayness the niceness the underseved acclaimation. maybe if you came out and got a real education----yu could finally feel comfort. i would like to say im sorry about your son i know it hard to lose someone you love but his in pace now his not in pain anymore but your strong and i know he would want you to keep you and your family going you have alot going for you self and your little girl so listen to your heart john may god bless you. I am sorry for your loss, a lot of people can tell you they know how you feel, but most of them have never experience losing a child. they do mean well, but I know the pain that is with you, I lost my daughter in an accident and is very hard, but I do remember a saying when tears start to overtake me. Remember me sad, remember me happy, but if you remember me with tears do not remember me at all,I will always have these words in my heart and when I start to feel the pain of losing my daughter.I repeat them to myself and I start to look again to the future and the people that needs me here on earth. In my heart i will know I will see my daughter again when god calls on me. I sent you an email to a email address at .............earthalliance. I pray that you got it and read it. I also sent you a envelope and hope you got that too. I am a 62 year old grandmother who has her 42 year old daughter living with her now because she too and I know what you are going through. Our son and grandson was run over by a vehicle and killed. He had every breast bones broken, broken shoulders and neck, broken legs and severe head injuries. He was only 16. There was no investigation of the driver as to whether they were high or drinking. Whether you believe in God or Jesus or not, your son WILL be resurrected when GOD cleanses this earth once again through the Great Tribulation and Harmaggedon. Revelation 21: 1-4 tells us that pain, sorrow, sickness and death will be done away with and there is going to be a new heavens and a new earth, the paradise earth that God intended from the beginning to have on this earth but was ruined by Satan deceiving Eve. His purpose will still be carried our very soon because all the signs that he gave his disciples at Matthew 24th chapter are almost fulfilled now. The model prayer was that his WILL be done in heaven and alsp upon the earth. His name was to be declared mentioned at Psalms 83:18 and at Acts 15:14 he tells us that he would have a people out of the nations having his name. We have that precious hope of seeing our dead ones once again. What a wonderful hope and a Loving God to make such provisions for us through the sacrifice of his son Jesus Christ. I will pray for yous and hope that you too may come to an accurate knowledge and understanding of the bible, GOD'S word. My condolences to yous as our grief will continue untill the end of this system is done and the new one will begin. May GOD bless you through the merits of his son Jesus Christ. First of all, so sorry for your loss. I feel your pain, knowing that you lost your pride and joy and beloved son. Wish some of us who have sympathy could be there to allow you to express your grief. You need to greive in whatever way you need to and the rest of us need to support and respect the process you must go through to heal. YOur timeframe, is just that, what works for you. All of us need to give you space and time to do that. I lost a mother to a mental illness when I was a young teenager. Trust me, I know how you must feel to lose a loved one, whether it be your young child or as a young child, as in my case. I am a 50 year old fan of yours, a tad younger then you. It pains those of us who admire you to see you suffer. Please take your time in going through this process. No one should judge how you do this, how long it might take; but, we knew that your son was the light of your life, as he should have been. You are a terrific actor and have always felt have the highest morals, integrity, intellect,were funny when the occasions arise, and a knack for understanding the world. Again, you are in our prayers, those of us who admire and feel empathy still for your loss. We hope your family gives you the space you need and some of us trust me in whatever way we can want to help you recover, but, respect your timetable and your process. Prayers are all we can do and we hope your religion sustains you through for the time being. It will take time, we all need to respect this. 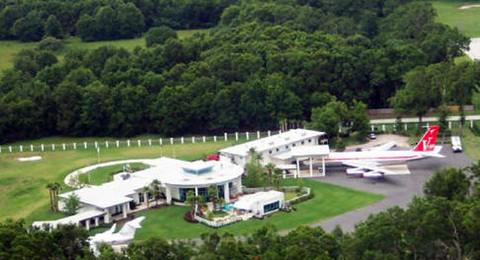 Nice home and airport for John Travolta. So can we have a ride in your plane we live near the New Ulm Airport. We just went to the Fly in Breakfast here. John is hot in Grease and unforgetable. So why doesn't he have some awesome software to teach others how to fly. I need some help with it and wish there was some flight software. Take Care John my grandpas name was John Henry. We just went to church and to the airport clear day to fly today wish we had money to fly and could learn to fly. "Fly like an Eagle".... maybe his next moview will have wings. Whomever wrote the original story and took the video has taken Travolta's place a bit out of context. Not selling Mr. Travolta short, obviously he is a wealthy person with some extreme extravagancies. But the place he lives, Jumbolair (formerly Greystone) is an airport community. There are hundreds of these around the US, and several in Florida alone. 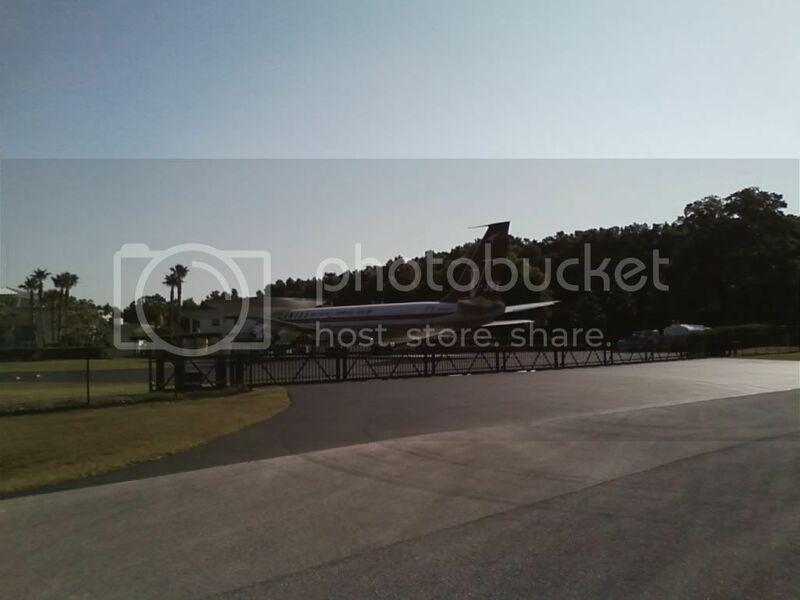 Greystone is particularly attractive to him because it has a runway nearly 7,500 feet long and 250 feet wide - designed especially for jets. Several of the residents at Jumbolair have jets - believe it or not, the original builders/owners of Jumbolair had three 707's. Mr. Travolta's is not the only 707 at the community. The community is home to several wealthy people and surrounded by grand horse ranches. Mr. Travolta purchased a piece of land within the Ocala community, which gave him rights to use the airstrip. He custom built his unique home. 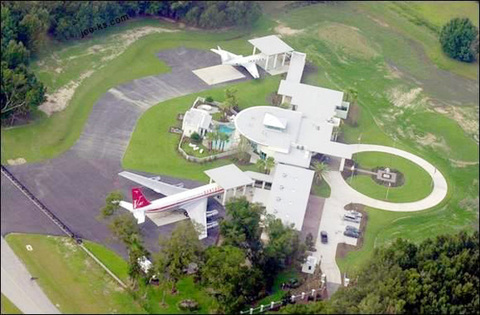 Mr. Travolta used to live at Spruce Creek airport community on the east coast of Florida, but was met with complaints with the noisy operation of his aircraft. The video shows the open hangers which contain aircraft that belong to other residents of the community. It's hard for some people to understand, but airport communities are similar to those people who are lucky enough to own homes on the Intercoastal waterway where they can dock their boats behind their homes. By comparison those of us pilots that chose to live in an airport community can park our airplanes at our homes. Though most of us will never know what it is like to pull up in a multi-million dollar jet... many of us enjoy taxiing our Cessna right up to our house. It's truly not any different than owning a reasonable sized boat and docking it at a lakeside home. Even dollar-wise, it's not that different. This said, Jumbolair is an airport community that is exclusive in the extreme. There are a number of very wealthy people that live in the community. And just for the curious; the community has no connection or affiliation with Mr. Travolta's other "associations". Dear John Travolta I have a cousin who claims she is your neighbor there in Ocala. She says is married to the owner of a carpet business and said that she used to bake cookies for your son, Jeff. Do you know an Ora Mae Shaw or maybe it is still Taylor? I am just trying to find out if this can possibly be true that she knows YOU and your family that personally!! I was in that community today. I was at the home that is shown between 7:30 to 7:36 in the in the film. The contractor told us that John Travolta's home was at the end of the street. I was a little skeptical but I knew he lived in Ocala somewhere, and with the size of those planes in his back yard I thought maybe. Now that I did a little research online I am positive that it was his home. Pretty cool !! !